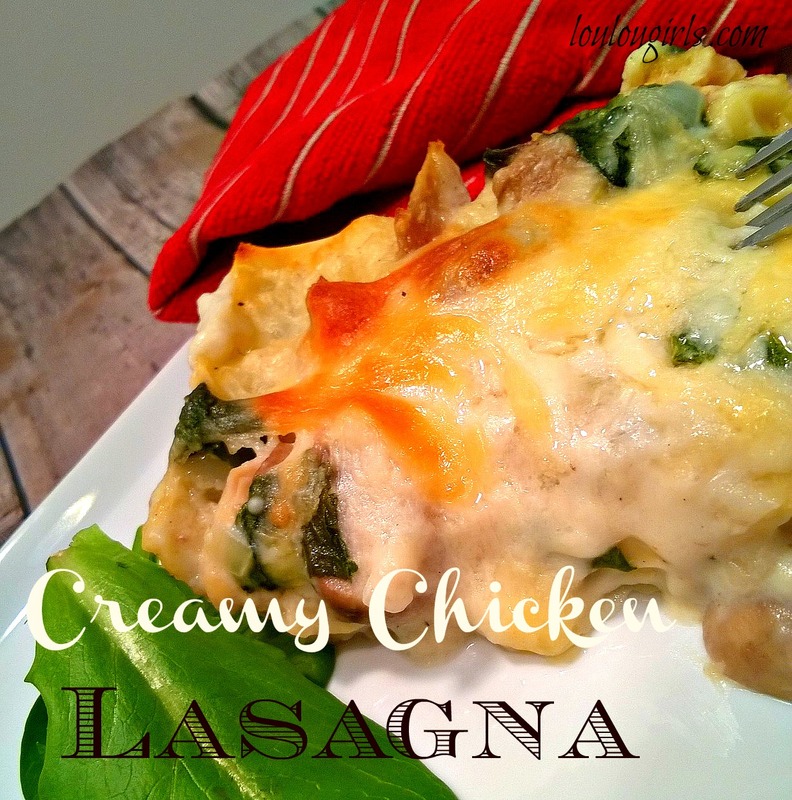 Through the years, lasagna has been my go to dish when I needed to take meals to neighbors and family dinners, but I have never made a chicken lasagna. A little crazy, since I usually pick chicken over beef when it comes to meat, and creamy white sauces are my all time favorite! I have been on a quest to find yummy, easy, healthy meals for my family, and this one almost fits every category. It’s a healthier version than what you usually find because there isn’t any cream and the chicken is rotisserie, but there is noodles and cheese. It is SO GOOD! Full of flavor and perfect for a busy week night because you can make it ahead of time and your good to go! In a large skillet, melt the butter on a medium heat. Add the mushrooms and cook, stirring often until the mushrooms are browned. Add the onions and garlic to the pan and saute until soft. Add the flour and cook, stirring with a wooden spoon, to make the roux. Stirring constantly, slowly add the milk and continue to cook until the sauce has thickened, about 5 minutes. Add the salt, pepper, nutmeg, paprika, onion powder, cayenne pepper, oregano and spinach and 1 1/2 cups of the cheese and keep cooking until the cheese is completely melted. Remove from the heat. Preheat oven to 375 degrees. Coat a 9 x 13 casserole with cooking spray. Spread ab out 1/2 cup of the sauce on the bottom of the dish. Make a layer with the lasagna noodles and then cover with sauce. Sprinkle with chicken pieces and then a 1/4 cup of cheese. Repeat steps until casserole dish is full. Ending with a layer of pasta covered with sauce, and sprinkle with cheese. 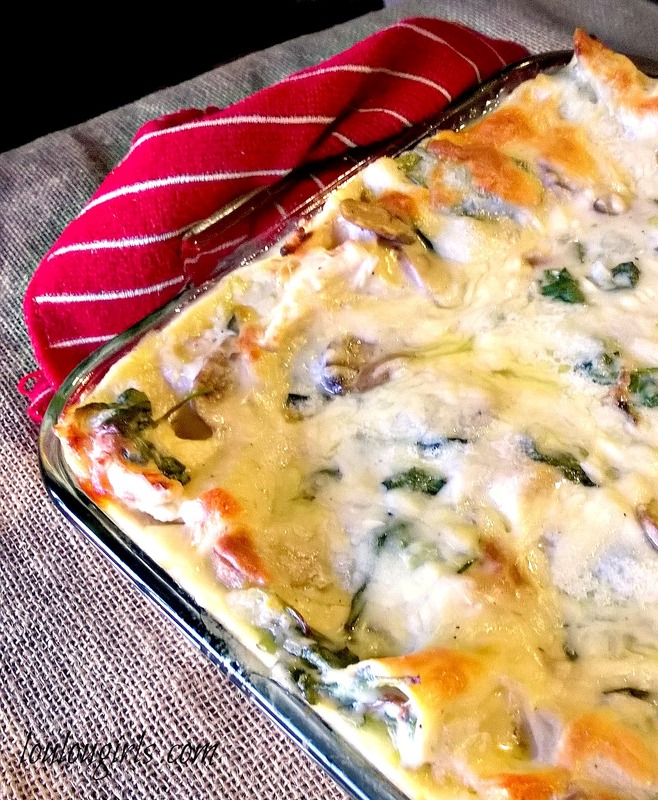 Place the casserole dish onto a baking sheet and bake, uncovered, for 45 minutes. It should be bubbly and well browned. Remove from the oven and allow to cool for 20 minutes before serving. This sounds interesting and delicious. Except for the noodles it doesn't sound like lasagna. Thanks for sharing. Oh I must try sound and looks fantastic. Thanks for linking up to Merry Monday! Pinned & Sharing on FB! Have a great week! That looks and sounds amazing. I haven't made chicken lasagna before. I think I will try this out. Thanks for linking up to Tips and Tricks. Hope to see you again this week.